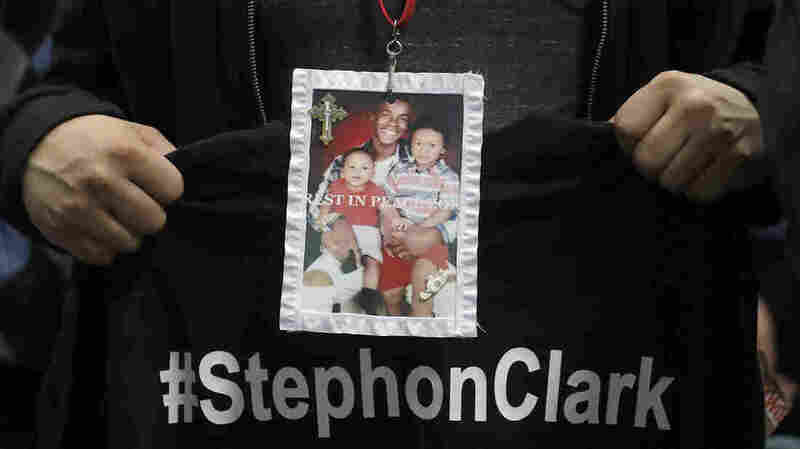 Sacramento Police Shooting: 6 Of 8 Shots Hit Stephon Clark's Back The city has experienced nearly two weeks of protests since 22-year-old Clark was killed by two police officers. A mourner displays a photo of Stephon Clark during his funeral services Thursday. Family lawyer Benjamin Crump said the findings of the family's autopsy contradict the narrative put forth by the Sacramento Police Department. The results were released at a Friday news conference by forensic pathologist Dr. Bennet Omalu, who conducted the autopsy. The first wound was to Clark's side, which led Omalu to conclude Clark was facing the house when he was first shot. Six other shots hit him from behind and one in the thigh. The Sacramento Police Department has said Clark was shot at 20 times. Sacramento Police initially said "officers believed the suspect [Clark] was pointing a firearm at them." "Prior to the shooting, the involved officers saw the suspect facing them, advance forward with his arms extended, and holding an object in his hands," Sacramento Police said in a release a few days after the shooting. "At the time of the shooting, the officers believed the suspect was pointing a firearm at them. After an exhaustive search, scene investigators did not locate any firearms. The only items found near the suspect was a cell phone." In a statement after the press conference, the Police Department said further comment would be "inappropriate at this time" because the official coroner's report had not been released. Sacramento Mayor Darrell Steinberg echoed the department's call to wait for official results and that he knew the details would be "graphic and disturbing." Omalu, who is best-known for his brain injury research pointed at diagrams of Clark's wounds as he spoke. Seven of the bullets each "possessed a fatal capacity," Omalu said. Death was "not instantaneous," Omalu said, adding that his results suggest Clark lived for three to 10 minutes before he died. One question hanging over the case is whether officers got him medical attention quickly enough to be saved. It's unclear whether the wounds into his back occurred while he was upright or on the ground. The official coroner's autopsy has not yet been released and may take weeks to put together. Funeral services for Clark were held Thursday and attended by the city's mayor and the Rev. Al Sharpton. The city has experienced nearly two weeks of protests since the shooting. This week, activists have blocked thousands of fans from entering Sacramento Kings games and hundreds attended a boisterous community forum at City Hall, as Capital Public Radio reported. As KQED reports, the officers were guided by a Sacramento County sheriff's helicopter as they chased Clark. One officer can be heard on body camera video shouting "Show me your hands! ... Gun, gun, gun!" immediately before the shooting began. Video taken from the helicopter shows most of the shots were fired after Clark collapsed to the ground facedown. The Sacramento Kings are holding a community forum on Friday and activists have called for more protests Friday evening.